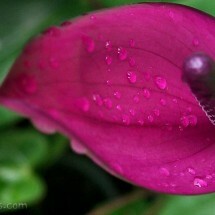 Anthuriums come in many colors: red, orange, purple, white, green, pink, peach. Some varieties have more than one color on the flower, whether the colors be blended together or speckled as if somebody threw paint at them. Some flowers are cupped, some are flat, others stand upright, some are heart shaped and others in almost a tear drop shape. 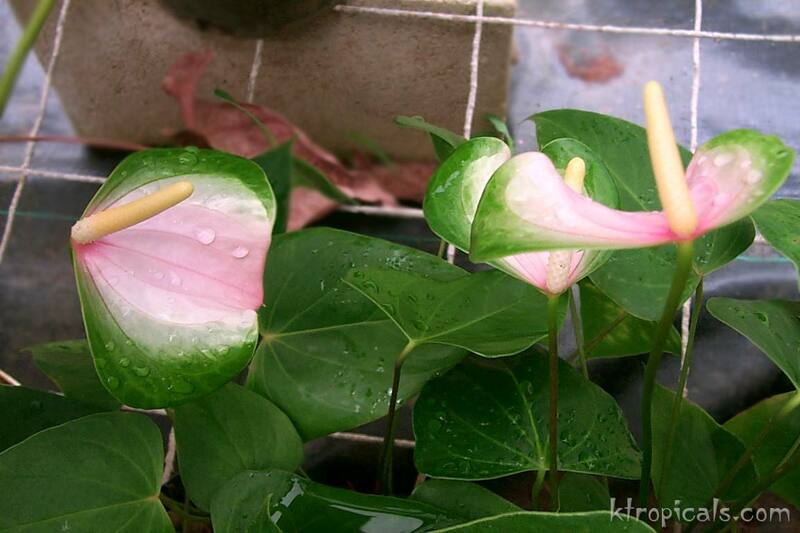 Anthurium flowers are long lasting, having a vase life up to 2 months. 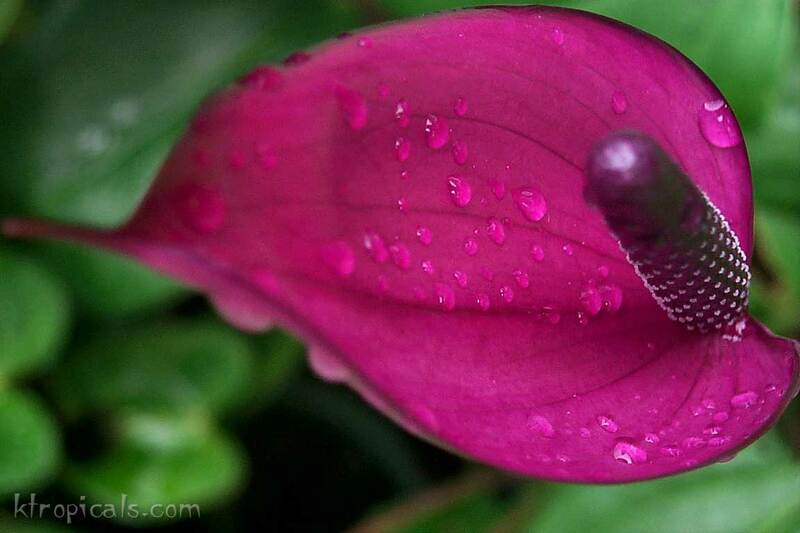 Anthuriums thrive in well draining soils. The soil is usually made up of a combination of cinder, coconut husks, tree fern fiber, bark, saw dust, charcoal, rocks, dirt and macadamia nut shells. 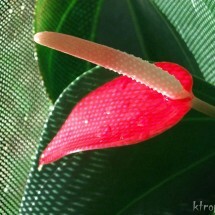 The anthurium grower mixes and matches the above for their own liking. 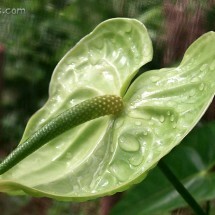 Anthurium plants also love shade and mostly grow in shaded areas. 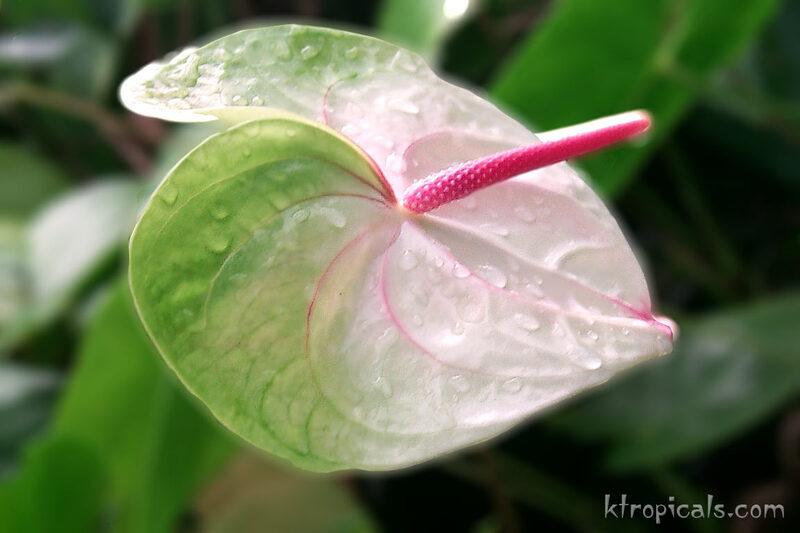 They are usually grown in shade houses while some growers have a fern tree forest and plant the anthuriums underneath the trees. 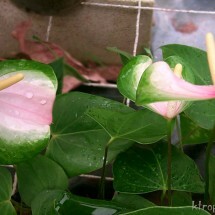 Anthuriums grow equally well in pots as well as in the ground. 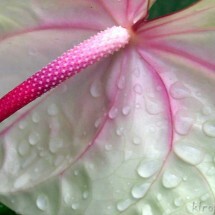 For every leaf that an anthurium plant puts out, there is a flower to follow it. Some anthuriums can get rather large. 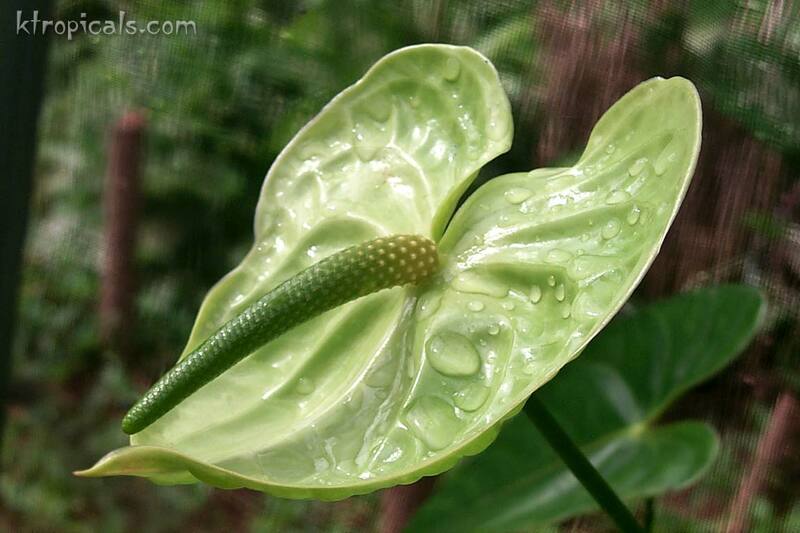 The obake, pronounced oh-ba-ke, anthurium is a hybrid created in Hawaii. 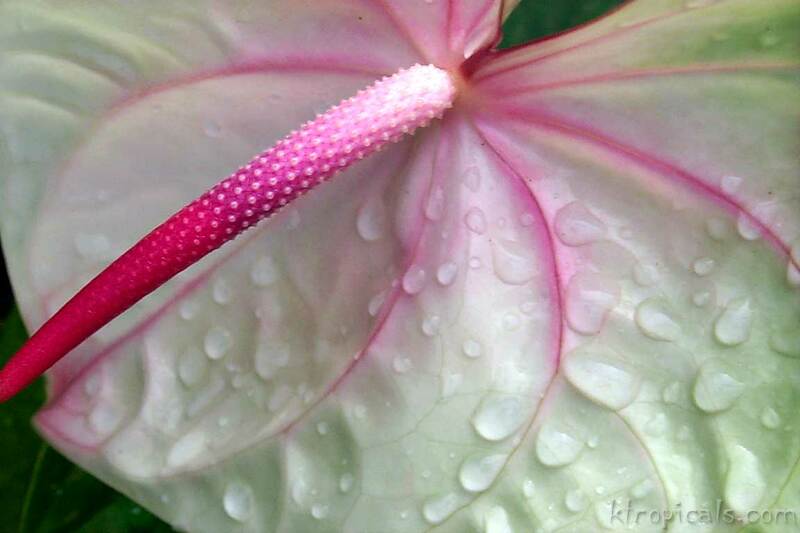 It’s flowers grow up to 11 inches wide and 9 inches long. 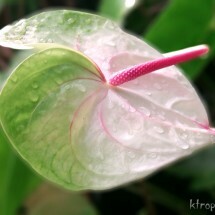 Anthurium comes from the words anthos oura. Anthos means flower and oura means tail, named this since the spadix looks like a tail. 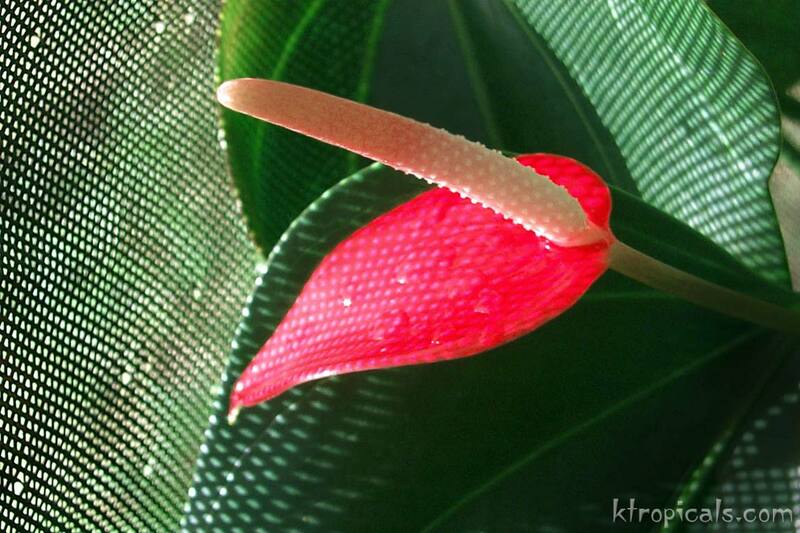 Here is a small photo sampling of some of the anthurium flowers we have growing in our greenhouse.